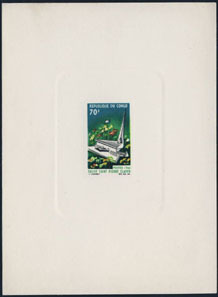 76140 OBL SURINAM (1938) 75th anniversary of emancipation. 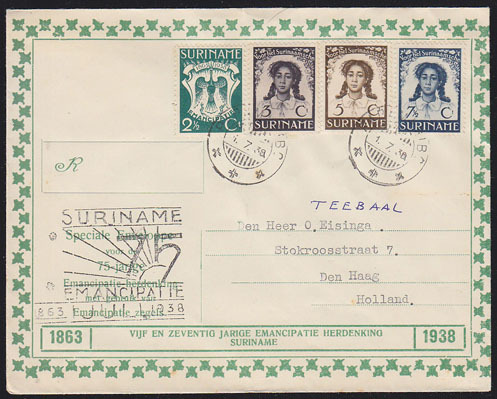 Letter from Suriname to Netherlands with 75th anniversary of Emancipation of Slavery cancel and franked with slavery surtax issue complete. 57783 ND CONGO (1963) Toussaint L'Ouverture*. Set of 3 imperforate corner pairs. Scott Nos 179-81, Yvert Nos 199-201. 60428 ND DAHOMEY (1963) Toussaint L'Ouverture*. Set of 3 imperforate pairs. Scott Nos 181-3, Yvert Nos 199-201. 74873 ND TOGO (1964) Lincoln*.Centenary of Emancipation Proclamation*. Set of 4 imperforates overprinted for JFK Memorial. Scott Nos 473-5,C41. 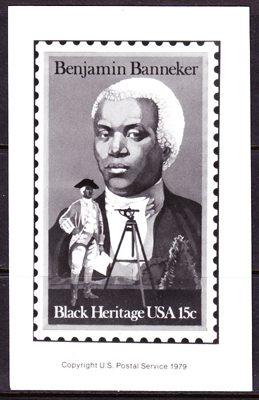 68724 EP U.S.A. (1980) Benjamin Banneker. USPS publicity photo essay. Scott No 1804, Yvert No 1273.